Diligence is a word rarely used any longer. As parents, it is often a lesson we must teach our children in opposition to the lackadaisical ideology that has saturated our popular culture. Consequently, much of the world has only a vague idea about what a diligent person may act like. Thus, I find it most fitting to start out defining this character trait before describing how important it is to employ in the home schooling arena. In essence, diligent behavior has to do with putting forth a steady, careful, and attentive focus toward any given subject. In applying this type of behavior, the outcome is a planned effort with the greatest likelihood of producing the most desirable end product. In home schooling then, a diligent effort would involve planning in a consistent and conscientious manner so the end result of the educational process would produce in a child everything the home school had, from the beginning, set out to successfully instruct. The Bible teaches that diligence put towards spiritual matters is what leads believers on the right pathway of God. As a home school educator, applied diligence results in maintaining a pathway that leads children to be prepared for God’s path and their future calling in life. Over the years I have had the privilege to talk with hundreds of home schoolers just beginning their schooling journeys. For most of them, the big picture of what lies ahead offers great excitement alongside many apprehensions. The lingering question most of them have when looking toward their end goal of home educating is, “Am I really able to give my child the best education possible?” Well, let me reassure you that you can give your child the best education and years of studies and testing scores have proven that fact. In fact, all new home schoolers face the same apprehensions about their ability to teach as well as their ability to pick the right resources to help in that pursuit. While resources for home schooling abound, they also often leave home schooling parents starting out on a path that is tremendously wide and filled with more learning possibilities, curriculum options, and customized educational opportunities than any one home educator could ever use. How Do I Give My Children the Best Education? These days the hardest part of teaching your child doesn’t have to do with a lack of resources or teacher training materials as it did in the past, but rather an overabundance. As a result, making firm choices and sticking to a specific plan only happens when parents take the time to carefully determine what their best resources are and how to effectively use those resources to reach the end goal for their child’s education. Here is where diligence becomes a key character trait for a successful home educator. 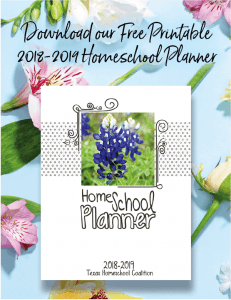 Being diligent in the planning process and keeping to a well thought-out plan, no matter how many times you need to tweak it in between, you will never end your home schooling years asking yourself if you did enough. You will know for certain you did all you could do and you handled your responsibility in a worthy manner. We at THSC are proud that Texans can home school with such great freedom because of the diligence we have applied to protecting your rights. Continuing in that effort, we also want to help you to be diligent in your calling and your desire to teach your children in a way that brings your efforts to a successful end. Therefore, we will be continuing this blog series over the next couple of months on the importance of record keeping and the efficient use of those records to keep your path straight. It is our greatest desire to see your home schooling efforts end in triumphant rejoicing over all God has done through your willingness to teach your children and prepare them for whatever He has ahead for their lives to live for His glory. Are you a member taking full advantage of your membership benefits? If not, check out your online membership account today and take advantage! These are just a few of the membership benefits. Check out our detailed listing and consider joining to take advantage of them today. Your membership supports THSC in Keeping Texas Families Free.